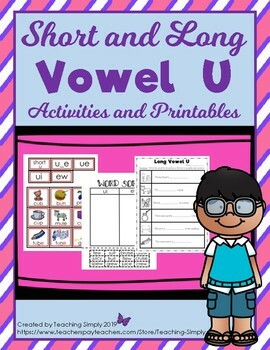 This product has a variety of activities to keep students interested in learning and practicing their long u spellings. Starting with picture sorts to ensure they hear the short and long sounds, they move into learning about the long u spellings: u_e, ue, ui, ew. There are several full color picture and word cards as well as cut and paste sorts for further practice. Also included are some fun coloring and maze pages that allow for more practice and two games that the kids will love. Plenty of repetition is provided for the new and struggling learner! 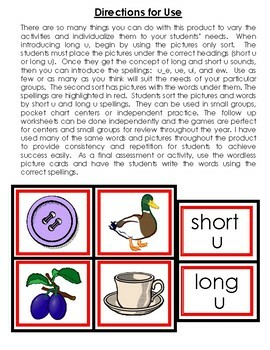 Page 2: Directions for use of the word sort, the two headings for categories (short u, long u) and 4 pictures to sort. 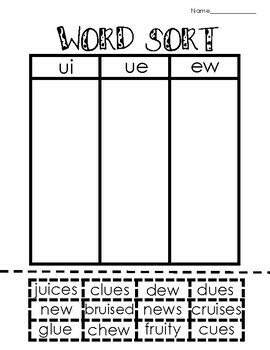 Pages 13-14: Word sort to be used in centers or small groups. Laminate for durability. Pages 28-29: Directions and front and back cover for game: BAM! Check out these related products by clicking on the links below.